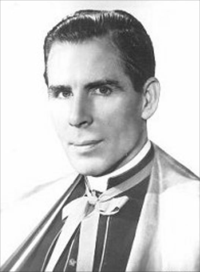 Catholic Archbishop Fulton Sheen died on December 9, 1979. He was known for his preaching and especially his work on television and radio. When he stated that, the Philadelphia era of the Church of God had already started to rise up (the most faithful represent”body of Christ”), the Vatican had officially come out against the millennial doctrine, and the one who is likely to be the final Antichrist may have been born (and one who was going to, in a major way, support a doctrine of Antichrist had certainly been). The stages for the final confrontation, which should occur in the 21st century, had taken place. Notice that the Catholic source above indicated that Archbishop Sheen supported the idea that an anti-pope would rise up. And that is a position that I too share. And if the 12th century Malachy prophecies about the remaining popes was complete and correct, then the current Pope Francis would be the anti-pope (there were 112 on that list and Pope Benedict XVI was number 111)–but because the Malachy prophecies cannot be trusted and Pope Francis is old, the final antipope could be a later pontiff. It should be noted that Malachy’s list contains anti-popes according to Catholic scholars (and they have none for centuries by their count). At least one Cardinal (Australian Cardinal George Pell) has seemingly indicated that Pope Francis could be an antipope (for some details, watch the video Anti-Pope Francis?). Because of his ecumenical, economic, and inter-faith agendas, Pope Francis may well be the antipope that Catholics have worried about. Both biblical (Revelation chapters 17 and 13) and Catholic prophecies teach of a leader based out of the city of seven hills which will be unfaithful. Pope Francis has taken steps that various people wonder about (see also Why Should American Catholics Fear Unity with the Orthodox?). Irrespective of the status of Pope Francis, we are living in the last days. And although the Great Tribulation is not yet, events aligning with the Apocalypse are occurring regularly and are often reported at the COGwriter website. Stay tuned for more updates. The Malachy Prophecies and “Peter the Roman” An Irish bishop allegedly predicted something about 112 popes in the 12th century. Pope Benedict XVI was number 111. Francis would be number 112–if he is that one–and if so, he is to reign until Rome is destroyed. May he be an antipope/final Antichrist? Anti-Pope Francis? Some cardinals and other members of the Roman Catholic clergy are concerned that Pope Francis has deviated from its traditional positions on matters such as homosexuality, salvation, fornication, remarriage, and other doctrines. Australian Cardinal George Pell even mentioned ‘antipopes’ when discussing Pope Francis. North American Cardinal Raymond Burke has raised many concerns about Francis’ pontificate. Did Catholic saints teach that popes could become heretics? Will the final pope not be Catholic? Is an ecumenical pontiff possibly the final Antichrist? What do both biblical, and even Roman Catholic, prophecies warn about? Could Pope Francis be an antipope and final Antichrist? Does God Have a 6,000 Year Plan? What Year Does the 6,000 Years End? Was a 6000 year time allowed for humans to rule followed by a literal thousand year reign of Christ on Earth taught by the early Christians? Does God have 7,000 year plan? What year may the six thousand years of human rule end? When will Jesus return? 202x? There is also a video titled The 6000 Year Plan: Is the end of humanity’s reign almost up? When Will the Great Tribulation Begin? 2016, 2017, or 2018? Can the Great Tribulation begin today? What happens before the Great Tribulation in the “beginning of sorrows”? What happens in the Great Tribulation and the Day of the Lord? Is this the time of the Gentiles? When is the earliest that the Great Tribulation can begin? What is the Day of the Lord? Who are the 144,000? Here is a version of the article in the Spanish language: ¿Puede comenzar la Gran Tribulación en 2015? ¿Es el Tiempo de los Gentiles? You can also see the English language sermon video: The Great Tribulation from the Mount of Olives. This entry was posted on Wednesday, December 9th, 2015 at 12:01 am	and is filed under Religious News. Catholic Fulton Sheen taught we were in the last days; Might Pope Francis be confirming this?